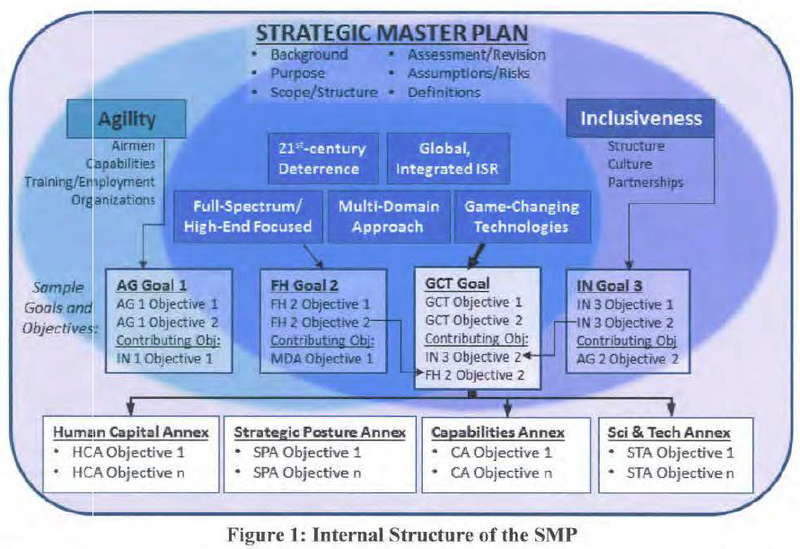 The SMP aligns long-range Air Force strategy, policy, and guidance with planning and programmatic decisions of senior Air Force leadership in support of National Defense and Combatant Command requirements. It does this by prescribing broad goals and objectives that help guide development of plans throughout the Strategy. Planning, and Programming Process (SP3) and associated inputs to the Joint Capabilities Integration Decision System (JCIDS) and Planning. Programming, Budgeting. and Execution (PPBE) systems. As described in the Air Force Strategy. the Air Force must aggressively pursue a path that leads to the instit11tional strategic agility required to adapt and respond faster than our adversaries in an increasingly dynamic environment characterized by constrained resources. Although the core SMP does not specify priorities for investment or divestment. its imperatives and vectors provide shared understanding that empowers Air Force senior leaders to align interests and reach consensus in the face of difficult planning choices. The priorities expressed in the four annexes provide a framework to guide HAF, MAJCOM, and CFL staffs as they build balanced options for the Air Force within the SP3. The Air Force will increase Agility by strengthening our culture of adaptability and innovation in Airman development and education. capability development, operational training and employment, and organizations. To increase our Inclusiveness. we must focus on empowering the members of the Air Force Team, improving the structure and culture that populates it. and expanding our connections both outside and within the Service. 1. Provide Effective 21st-century Deterrence: The nuclear mission remains the clear priority of Air Force leaders, but the Air Force also offers many additional capabilities to deter a wide range of actors. 2. Maintain a Robust and Flexible Global Intelligence, Surveillance, and Reconnaissance (ISR) Capability: The Air Force will employ agile multi-domain solutions to detect, characterize. deter, and defeat adversaries. This requires an agile, coordinated multi-domain ISR approach that provides commanders with multiple options. 3. Ensure a Furl-Spectrum Capable, High-End Focused Force: The Air Force must focus on the skills and capabilities that deliver freedom of maneuver and allow decisive action in highly-contested spaces. However, we must retain the ability to succeed in low-intensity conflict. 4. Pursue a Multi-Domain Approach to our Five Core Missions: To achieve the most effective solutions across the spectrum of military operations, we will increasingly integrate and employ capabili1ties operating in or through the cyberspace and space domains in addition to air capabilities. 5. Continue the Pursuit of Game-Changing Technologies: We must continue to pursue radical improvements in technology, that when combined with new approaches and organizational changes, expand or maintain asymmetric advantages over adversaries. This requires the identification and harvesting of potential breakthroughs in thinking d1at might amplify the enduring effects that underpin our advantages in air. space, and cyberspace. By establishing a core strategic approach that spans the Air Force. the SMP represents a significant shift in the way the Air Force conducts its business. As subsequent iterations of the SMP inform- and are informed by-annual Planning Choices events and ongoing Service-wide activities to organize, train, and equip the Service. 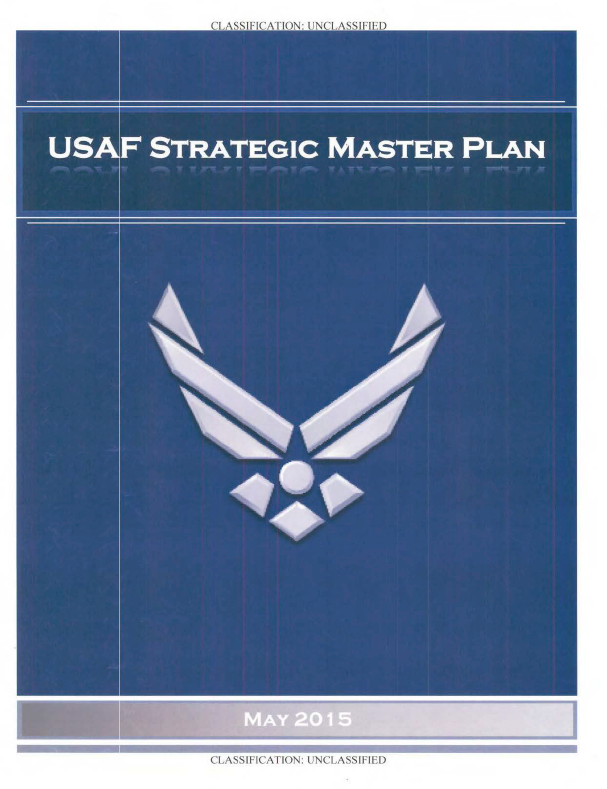 the structure and content of this document will evolve to best articulate the Air Force’s long-range strategic plan.